A simple and uncomplicated approach best defines our restaurant, but it’s the great oysters, smoked delicacies, fresh local fish and shellfish that keep our customers coming back again and again. The atmosphere here is relaxed and informal, marble cafe tables, metal framed chairs and chalked up specials are all part of the charm. But the reason this little restaurant, tucked away on the Market Square at Orford, is so popular is the superb quality of the fresh seafood. 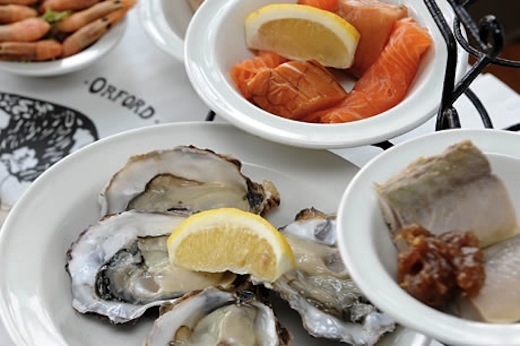 Start with a half dozen plump Butley oysters, some home-made smoked salmon pate or maybe a plate of griddled prawns, hot and smoky and oozing garlic butter. To follow you can't go wrong with the rich and creamy fish pie, skate with a brown butter sauce or the catch of the day, freshly prepared and served with new potatoes and a salad. We look forward to welcoming you at the Oysterage soon.